He said; “While the President Muhammadu Buhari led government is still being confronted with the MainaGate’s global shame, the Senator representing the Bauchi Central Senatorial District, Isa Misau, yesterday, came with yet another bombshell that the Inspector General of Police, Ibrahim Idris, gave two Sports Utility Vehicles (SUVs) to the wife of the President, Aisha Buhari. “Even though the police has said the vehicles in question were meant for the police personnel in the convoy of wife of the president, Nigerians will like to see records of such vehicles provided for the security personnel of previous First Ladies. Most importantly, what happened to the promise made by the President not to operate the Office of the First Lady? “In the last one month, Nigerians have been confronted with messy revelations like the fraudulent reinstatement of Abdullahi Maina, who was declared wanted for corrupt practices by the International Police Organisation, (INTERPOL) after he was dismissed from office by the Civil Service Commission in 2013 for allegedly committing N2.1 Billion pension fraud while in office. “Minister of State for Petroleum Resources Ibe Kachikwu’s allegation of award of $25 billion contracts without following due process against the Group Managing Director (GMD) of the Nigerian National Petroleum Corporation (NNPC); Dr. Maikanti Baru. “Reinstatement of the former Chairman of EFCC, Ibrahim Lamorde, who was accused of corruption by the Senate, removed from office unceremoniously and declared wanted, as the Commissioner of Police in charge of the Special Fraud Unit (SFU), Ikoyi, Lagos. “Appointment of Ahmed Gambo Saleh; the Supreme Court Registrar, who was indicted and put on trial for alleged over N2 billion fraud, as the Secretary of the National Judicial Council (NJC) and Secretary of the Corruption and Financial Crime Cases Trial Monitoring Committee, headship of which has now been rejected by Retired Justice Isa Ayo Salami. Speaking further, the governor said; “While I await yet another scandal in what has become a government of one week, one scandal, I ask our President what has happened to the report of the committee that investigated the $43 million discovered in an apartment at Osbourne Towers, Ikoyi, Lagos? “What has happened to the allegation of award of $25 billion contracts without following due process made against Dr. Maikanti Baru by Dr Ibe Kachikwu? “What happened to the DSS indictment for corruption of the Acting Chairman of EFCC, Ibrahim Magu and the Attorney General of the Federation and Minister of Justice, Abubakar Malami (SAN) Investigative Panel set up by the President? “Who is the owner of that shop the LEGICO Shopping Plaza, Ahmadu Bello Way, Victoria Island, Lagos inside which the EFCC claimed that it found N448.8 million cash? “Who brought the five sacks in which the EFCC claimed that it found N49 million cash to the Kaduna Airport? “What happened to the probe panel on the alleged N500million bribery said to have been paid to the Chief of Staff (COS), Abba Kyari by officials of South African owned MTN Telecommunications Company with the intent that the COS influence government to discontinue its heavy stance on the $5billion fine imposed on the company? “Most importantly, the President directed the Head of Civil Service of the Federation, Mrs. Winifred Oyo-Ita, to submit a report on the circumstances surrounding Maina’s reinstatement to his Chief of Staff, Abba Kyari, before the close of work on Tuesday, today is Friday, what has happened to the report? “Is the President going to use APC broom to sweep the report on Maina’s fraudulent reinstatement under the carpet just as he did to others before it? “One can go on and on, but the painful reality is that Buhari’s government is not only corrupt, the government itself is corruption! “In other words, perfume is being sprayed on corruption when it affects Buhari’s men while insecticide sprayed on corruption when it involves perceived political opponents of the President. “Like I have maintained, President Buhari is not fighting any corruption. He is indeed the Life Patron of Corruption in Nigeria, who is hiding under anti-corruption fight to harass his perceived political foes. 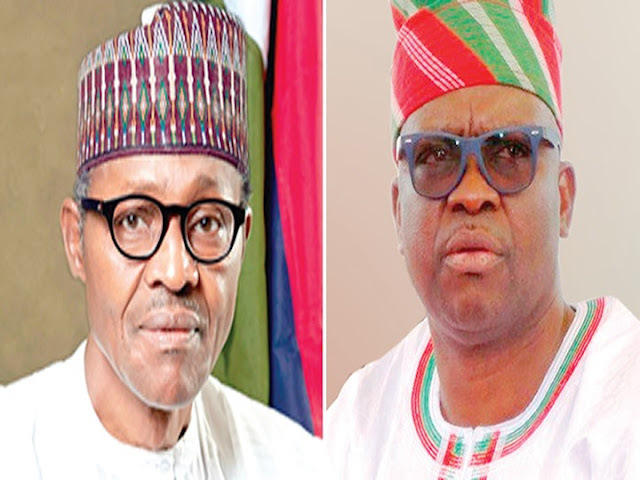 However, like every affliction of the Israelites, all these too shall pass and Nigeria shall be free from this Buhari’s government and its odour of corruption in 2019.”Fayose: Buhari’s govt. rotten, covered with scandalous corruption, alleges plot to release fresh “Chibok Girls”.